You are here: Home>Journal>Fruit Soup! Surely Not? In a recent survey, it was discovered that 37% of UK citizens favour tomato soup to any other, making it the most popular in the country. Given the tomato is actually a fruit, we at St. Dalfour wondered if as a nation we should be eating more of these fruit soups, and if so, would they pave the way in becoming the UKs new favourites. Fruit soup is believed to have originated in Scandinavia and is still a popular dessert in Sweden and Norway. Known locally as “Blandad Bruktsoppa”, literally meaning mixed fruit soup, it was originally made with dried fruits. This is because fresh ones were widely unavailable during Scandinavian winter. Being a versatile yet simple soup, traditionally it can be served hot or cold depending on the time of year. This makes it a perfect option for the oxymoron of conditions we all tolerate here in Great Britain. To make your own delicious fruit soup at home, simply add your favourite St. Dalfour preserve to a fruit juice of your choice, some plain yoghurt and a selection of softened fruits. 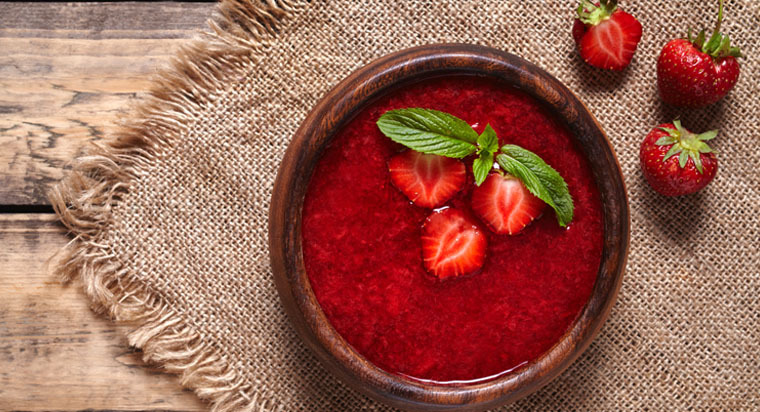 So whether you’re wanting a warm and nutritious way to start your day, a sweet zingy boost at lunch time, or a delicate way to end an evening meal, fruit soup has to be the most versatile soup for the job.